Join the movement! Become a National Demonstration Site. Promote leadership through best practice principles that create outdoor play environments that address inclusion, incorporate nature, introduce outdoor fitness, and promote physical activity. 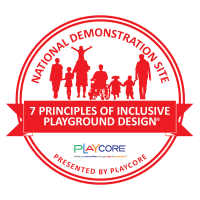 PlayCore’s National Demonstration Site program was conceived to recognize thoughtfully planned outdoor play environments that ensure that people of all ages and abilities can be physically and socially active through play and recreation. Communities that are recognized can create positive attention and attract partners and funding that support this social capital. Additionally, by collaborating with program partners, the successful process can be replicated for others to share. 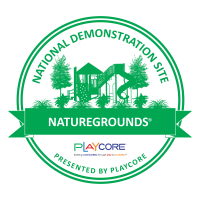 We have created summary sheets for all 4 of PlayCore’s National Demonstration Site programs. To download this information, please click the links below for the program that aligns with your planned project. National Demonstration Site awardees also receive a letter of recognition and special signage for serving as a leader in best practice implementation for their communities. Their recreation site will also gain national awareness through various media outlets, press releases, collateral materials, and nationwide presentations. 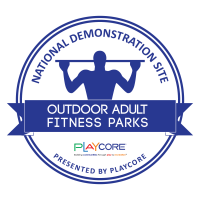 To find out if your upcoming project qualifies for National Demonstration Site status, contact your local recreation consultant. The Unity Adaptive Playground began as a dream by the Autism Hope for Families support group, founded by Phil and Nikki Jacobs. Their 7-year old daughter, Raylin, was diagnosed with autism at the age of 21 months. “We wanted a place where Raylin could go and be among other children, and be accepted in a happy, unstructured environment” said Nikki. This accessible new playground was awarded National Demonstration Site status for Inclusion, by PlayCore last November. Signal Centers designed their vision of a multiple age-range, inclusive play environment that factored in challenging topography, and the therapeutic services that their center offers to the community. With constitiuents that range in age from 6 weeks to adulthood, the playground needed to serve both children with and without disabilities. Not only is Signal Centers playground aligned with the 7 Principles of Inclusive Playground Design, it is also certified as a NatureGrounds® playground - infusing nature into the play environment. The John Cooper School is an independent, college-preparatory day school located in The Woodlands, an unincorporated planned community in Montgomery County, Texas. When selecting the design for their new playground, they chose a themed tree fort structure that included multiple nets, inspiring physical and cognitive challenges. 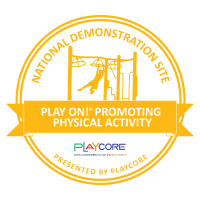 Because their site included the six elements of play - sliding, swinging, climbing, spinning, brachiating, and balancing, they were awarded National Demonstration Site status for PlayOn!, by PlayCore, for recognizing and promoting physical activity through well-designed outdoor play and learning environments.